If you ask a child what she hopes to be when she grows up she will likely tell you a variety of answers. The list would likely dive into dancing, animal taming, the professions of parents, and jobs that haven’t even been created yet. This question usually causes an imagination to run away in a child. There are certainly things that may hold this child back or people that want to wipe away the young dreams. There are difficult things that happen, even to children, but for the most part when you are young it seems that the sky is the limit. What I have been realizing lately is that the older I get, the more I ‘grow up’, the more doors that seem to close on this ‘I can do anything’ mentality. I will probably never be a vet, a professional horse back rider, or a hairdresser. And I am okay with that. Choices and circumstances have led me to where I am today. It seems that for many people it can become easy to feel trapped in the ordinary. It can become a place of discontent, a place where one only dreams of the childhood freedom with endless options that once seemed to pave the road in front of them. We can become frustrated in the ordinary while desiring the extraordinary. And yet, I would argue that there is an immense amount of extraordinary in every ordinary situation. In fact, it seems that things that we used to think were extraordinary can become seemingly ordinary. Perhaps instead of chasing after the next amazing thing, we ought to shift our perspective to see the greatness of what is right in front of us. When you buy a new car it certainly will bring happiness at first. You may feel joy as you sit in the seat, breathe in the new car smell, and turn the key for the first time. But after weeks the smell fades, and months later there is a stain on the backseat, coins littered on the floor, and dust on the dash. You no longer get in and take the deep breath, you no longer feel the stir of excitement. It becomes a tool to get you from A to B. It becomes a prayer that no lights pop up on the dash. This is all to say that to chase after what we perceive as extraordinary can be like putting a piece of cotton candy in your mouth. So sweet at first but quickly dissolves. If you don’t know, my husband and I are the pastors of a young adults church called The Embassy. We are a mobile church that meets on Monday nights on campus. Each week we rent a UHaul, pack up all of our equipment, transfer it to the campus, unload, set up and do everything in reverse at the end of the night. It can be taxing, exhausting and frustrating. It can also be extraordinary. I have seen joy demonstrated, relationships take form, and laughter spread. I have seen community grow. I have seen what the sacrifice of time and ability can do for our church. It seems so ordinary, so mundane, so repetitive. But it has created a church where community is deep and people love one another. 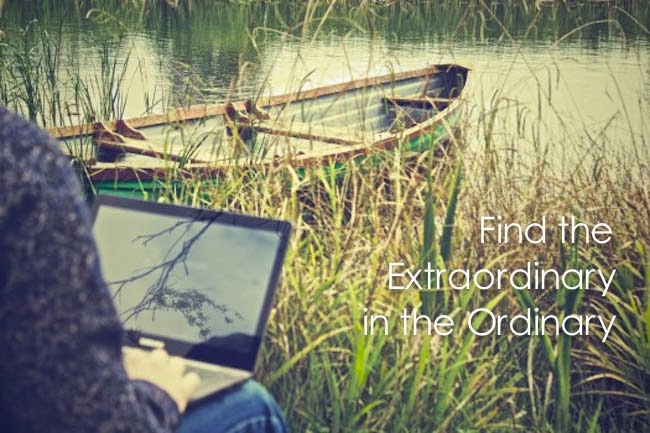 It is the extraordinary in the midst of the ordinary. I firmly believe that the extraordinary doesn’t necessarily live on the other side of the fence. It most likely lives in the things that surround you. It is in the early morning sun, the conversation with a friend, the satisfaction of a clean house. It is in the project getting finished, the late night trip to McDonald’s, the photo where you captured just the right light. Perhaps you are in a place in life where changes need to be made. It might be best for you to make a career change, go back to school, or move houses. There is nothing wrong with these aspirations! I would simply suggest looking at the motivation. Look at why you want the change – is it because you feel it would bring the extraordinary? Truly, the extraordinary lives in the ordinary. Take a moment to rest in gratitude, recognize what you have, make small changes in order to get a better view of the good in your life. It is there, and it is likely hidden away in the most ordinary places.